I think it's safe to say that when most people think of murder and torture, the word comedy doesn't usually come to mind. For better or worse, however, it appears that writer/directors Aharon Keshales and Navot Papushado are not most people. With their latest effort, the duo have crafted a twisted tale of disturbing violence and unnerving evil -- all layered within a whimsical air of dark humor. Yes, you read that correctly. I said whimsical. And as potentially antithetical as all that might sound, the filmmakers somehow make it all work. In fact, they make it work beautifully. Well, as beautifully as blood-soaked carnage can work, anyway. An offbeat mishmash of horror, comedy, and crime thriller sensibilities, the movie is a unique piece of genre filmmaking that is both playfully humorous and powerfully unsettling, creating an adult "fairy tale" that trades in the magic of fantasy for the cruel nightmares of the real world. After a young girl is brutally violated and murdered, a renegade police detective, Micki (Lior Ashkenazi), takes it upon himself to seek out justice. Determined to find the man responsible, he attempts to interrogate the prime suspect, a seemingly harmless teacher named Dror (Rotem Keinan) who continually proclaims his innocence. But the deceased girl's father, Gidi, has his own plans for the alleged killer, and soon the three men find themselves caught in a deadly game of torture and revenge. But is Dror really the murderer, or is the true killer still at large? Based on its dark premise and disturbing subject matter, I can't say that I really expected to laugh a whole lot during 'Big Bad Wolves.' With that said, to the filmmakers' credit, I eventually found myself embracing the flick's warped sense of humor, and the manner in which the directors are able to balance the movie's unusual tone is really quite impressive. On the surface, the narrative is very unsettling, dealing with concepts like pedophilia, murder, and torture, but the movie maintains a playfully twisted air of comedy throughout. To be clear, the filmmakers never make light of any of the heady topics I just listed -- instead, they simply find a way to frequently undercut the film's mounting tension with quirky character beats and an almost bumbling chamber play quality. You see, Gidi's plan to torture Dror doesn't simply go off without a hitch, and the various setbacks he runs into prove to be surprisingly entertaining. For instance, at one point Gidi is delayed from smashing a hammer into Dror's hands by a phone call from his amusingly nagging mother, bringing a bizarre sense of levity to an otherwise grave situation. It's this juxtaposition of the mundane and silly against other more horrible and violent occurrences, that ends up fueling much of the runtime's unconventional laughs. Likewise, the trio (and later quartet) of characters that rest at the center of the plot are all marked by entertaining idiosyncrasies. 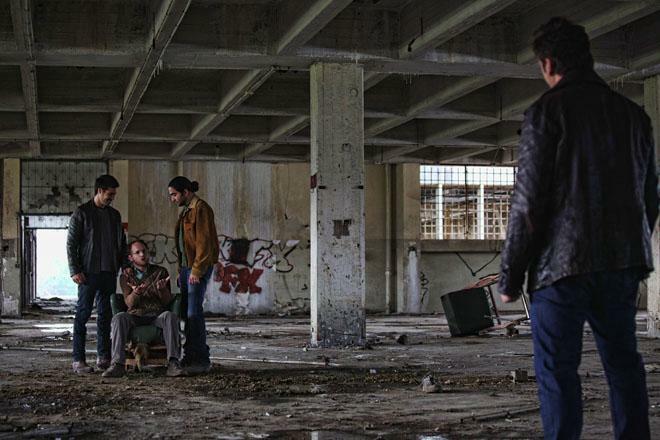 This is especially true of Gidi, and actor Tzahi Grad is exceptional in the roll. On the one hand, it's initially easy to sympathize with the man's quest for vengeance, but as the story goes on, right or wrong, he's essentially revealed to be psychotic, and Tzahi milks his alternately sadistic and mild-mannered behavior for ample laughs and scares. In the included special features, the filmmakers cite Tarantino and the Coen Brothers as influences, and the former is especially clear in their frequent attempts to deflate and extend the plot's ample tension with dark comedy. It's not all fun and games, though. Not by a longshot. Despite the strangely effective humor, this is still a deeply unsettling film that deals with ugly people doing very ugly things, and the script examines many complicated ideas related to justice, revenge, torture, and evil. As Dror's potential guilt remains ambiguous throughout much of the film, it becomes difficult to decide who the "good" and "bad" guys really are, constantly shifting the audience's loyalty while engendering weighty moral dilemmas. The filmmakers then take this inherent level of narrative tension and ramp it up through their compositions, camera movements, editing, and music, creating a palpably anxious and unnerving experience. The opening slow motion shot of children playing hide-and-seek is particularly effective, corrupting a traditionally innocent image with foreboding and dread while economically setting up the plot's central tragedy. Stylistically, the movie also becomes a legitimate horror film, and its level of violence and gore can be very graphic. In other words, this isn't a flick for the squeamish. In many ways, 'Big Bad Wolves' almost plays out like a dark comedy version of Denis Villeneuve's 'Prisoners,' and while that might initially sound like a terrible and potentially tasteless prospect, the directors somehow find an appropriately twisted balance between black comedy and disturbing thrills -- one that never comes across as disrespectful to the script's otherwise bleak and sensitive subject matter. Funny, tense, and ultimately haunting, this is a genuinely unique hodgepodge of genres that comes together surprisingly well. An adult bedtime story filled with horror and devoid of heroes, like its title implies, this is simply a story about wolves, and their teeth are very sharp and ready to bite. That is, unless their nagging mothers call. 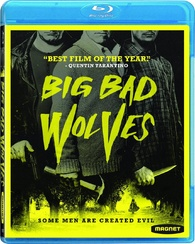 Magnolia brings 'Big Bad Wolves' to Blu-ray on a single BD-50 disc that comes housed in a keepcase with a cardboard slipcover. After some skippable trailers, the screen transitions to a standard menu. The packaging indicates that the release is Region A coded. The movie is provided with a 1080p/AVC MPEG-4 transfer in the 2.40:1 aspect ratio. Shot on the Arri Alexa, the picture has a sharp and crisp image that offers some impressive clarity and depth. The digital source is mostly clean and artifact free, but there is some negligible grain-like noise in darker scenes and a fleeting hint of shimmering in one shot. Detail is strong, providing a great sense of fine texture in the character's crazed and battered faces, highlighting every ambiguous glance and bloody bruise. The color palette fits well with the darkly whimsical content, offering an appropriately gritty look that still offers vivid saturation (reds are especially striking). Likewise, the picture also retains a pleasing sense of dimension, especially in brightly lit outdoor sequences. Contrast is high with bright whites and though they can veer a tad blue in isolated instances, black levels are deep with solid shadow delineation. Free from any distracting issues and marked by sharp detail, 'Big Bad Wolves' comes to Blu-ray with a very strong transfer that is both artistically and technically proficient. The film is presented with a Hebrew DTS-HD MA 5.1 mix along with an English DTS-HD MA 5.1 dub track and optional English, English SDH, and Spanish subtitles. Appropriately dramatic and tense, the music and sound design work well to complement the movie's twisted tone. Dialogue is clear and nicely balanced throughout. The soundstage is relatively wide and diverse, giving the track a strong sense of general ambiance (birds, office clatter, traffic). Directional effects pan between the left, right, front, and back with good surround use and design work. The movie's tenser moments are home to some truly spine tingling sounds as well, and every disturbing crack or smash comes through with fierce fidelity. Likewise, the Hitchcock inspired score is full of operatic foreboding, enveloping the room with dark yet faintly whimsical music cues. With that said, the mixing can sound just a tad forced at times, lacking the seamless imaging found in other tracks. Tense and menacingly playful, the mix goes a long way toward cementing the film's disturbing and darkly comedic mood. Magnolia has provided a slim assortment of supplements, including a worthwhile behind-the-scenes doc. All of the special features are presented in 1080p with DTS HD-MA 2.0 audio and no subtitle options (unless noted otherwise). Making of Big Bad Wolves (HD, 16 min) – This is a behind-the-scenes featurette with cast & crew interviews and on set footage. The participants discuss the movie's fairy tale influences, makeup, practical special effects, torture scenes, casting, and festival success. Though on the shorter side, there are some interesting insights here. AXS TV: A Look at Big Bad Wolves (HD, 3 min) – Presented in 1080i, this is basically an extended trailer with some interview snippets from the previous supplement throw in every now and then. Theatrical Trailer (HD, 2 min) - The film's trailer is included with DTS-HD MA 5.1 sound. 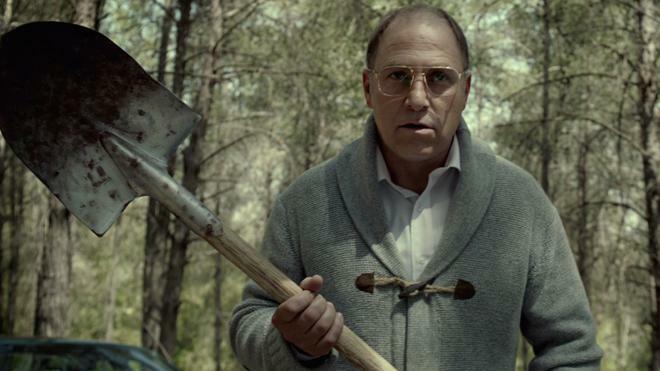 'Big Bad Wolves' is a deeply disturbing horror thriller layered with a surprisingly funny undercurrent of darkly playful comedy. On paper, its mixture of genres and tones shouldn't work, but the directors manage to blend the styles well, creating an unsettling and occasionally funny experience. The video transfer and audio mix are both strong, ramping up the film's tension. Unfortunately, we only really get one brief behind-the-scenes supplement, but there are some worthwhile insights from the directors. The movie's graphic depiction of torture and dark subject matter certainly won't be for everyone, but for those open to twisted humor and gore, this disc is recommended.